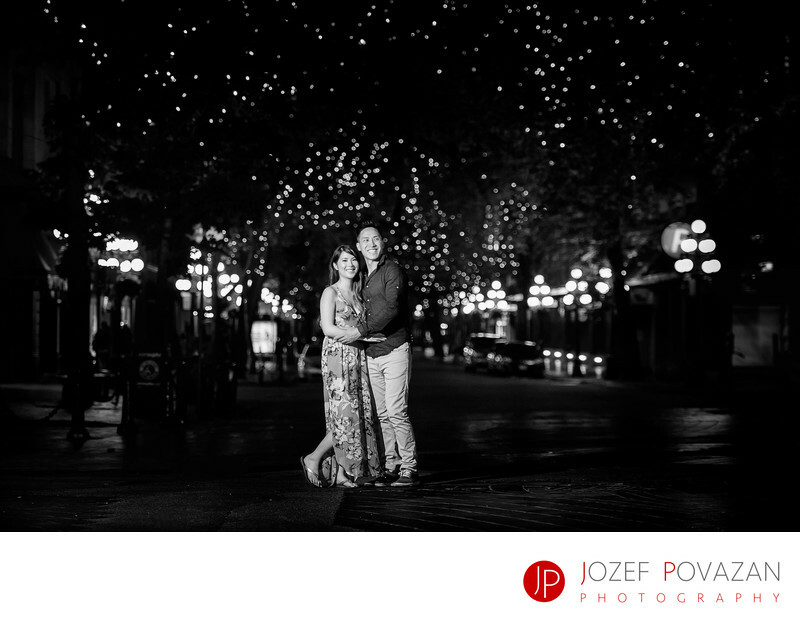 Gastown Romantic night Engagement under twinkle lights - Best Vancouver wedding photographer Jozef Povazan Photography studio. Gastown Romantic night Engagement photos under twinkle lights. Vancouver downtown has a very unique place every tourist should visit. It is Gastown. Narrow streets with brick walls, small boutique shops, culinary restaurants, famous Steam Clock and more. Romance and love is in the air specially if you come here at the night time. Almost empty streets, walking and enjoying each other and the scenery of this treasure in the heart of Vancouver. Story of W+D is very simple. They have a passion for great photos and with their wedding coming soon the engagements portrait were high on their list. It was my pleasure to get to know them and create for them amazing memories. Since I love BW images here is otherwise epic image even in colour presented more classic way. Contrast of the dark street and night sky with the twinkle lights crossing above their heads in tree lines were breathtaking to watch. Guys had to watch for the taxi drivers from time to time but with fun and laugh they had a amazing time together. It is not just about great pictures from wedding or portrait session. It is about the experience you have on that day and wedding photographer is usually the person who spent the most of the day with you. And if it is me, then you will have a chance to see me fairly close to you from time to time since I want to show your future children that how much fun you had on your big day so they can watch it like they were sitting in the first row of seat when looking at your happiness shining in the air. I am Jozef and I love photography and what it means for right people. Send me a message if my imagery caught your attention. Location: Gastown, Vancouver Downtown, BC, Canada.